Any one know if there is a screen out there that is the same size as the tiny shields that I could use with my project. So 20mm by 20mm or jsut a bit bigger is fine as well.I it operated at 3v3 volts that would be amazing as well. None of those screens will have the Tinyduino connector - you would probably need to make a small board for any of them, or possibly wire it up to a Tinyduino Protoboard. This one loooks amazing have you seen any one use it with an arduino ? No, I have not. I would caution you though about relying too much on the images shown in those listings. The one with the fish photograph looks very suspicious to me. I think it was photoshopped. The others might be more reasonable, but still... I just wouldn't trust the product pictures. 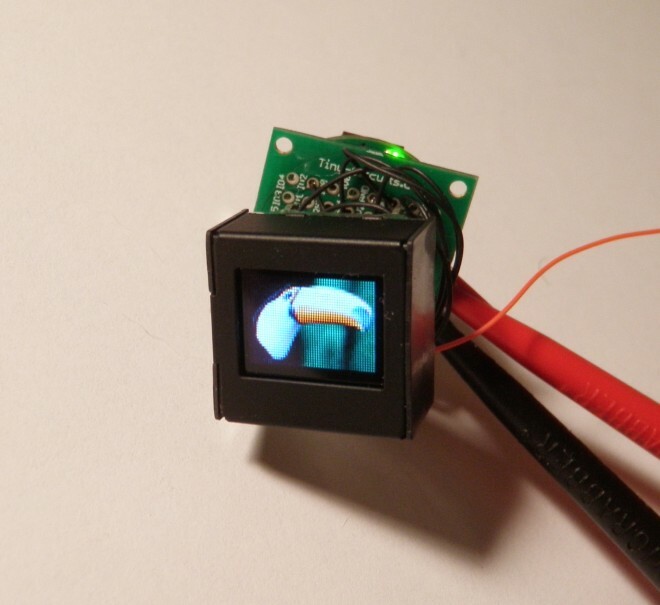 Actually we did use one of those NKK OLEDs for an initial proof of concept and it's shown in the Kickstarter video. Attached is a pict of this, it worked fairly well and is easy to program and the pictures are good, but it is very pricey. I'm impressed. The image quality is a lot better than I presumed it would be. Almost looks like it was made to fit the TinyDuino boards. It's actually quite tall though, which is a bit of a pain. It also requires a high voltage for the LCD drive (think around 11 or 12V) - the orange wire on the side is running off to a bench supply, so it's not easy to interface too. I think I might end up going with this http://www.adafruit.com/products/1393. Its small and lowish power so might work well. can i use this screen or is there another one ? will the tiny screen be usable with arduino ? This is a major question to me thanks for replying .. It scares me if i by one and there will be not cheap way to adapt it it zill be a mess ! Just buy it without the green blocks. then you can solder it to any type of arduino you want.